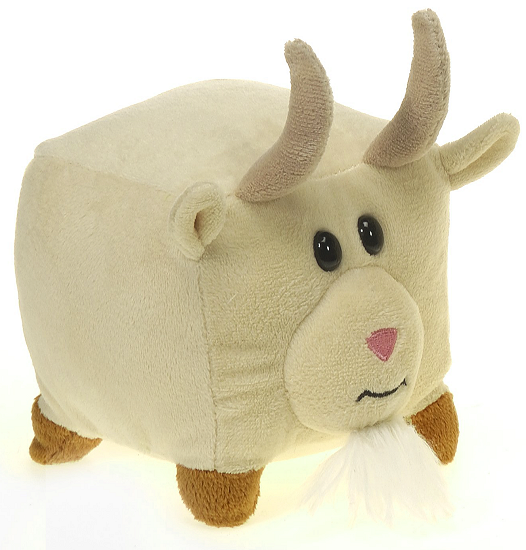 This little plush goat is adorably unconventional with a huggable square body that begs to be held. Part of The New Round collection by Fiesta, this lovable goat stuffed animal is cute and cuddly with soft cream fur, light brown hooves, taupe horns, a pink embroidered nose, and sweet black eyes. Full of personality and delightfully stackable with other animals in The New Round collection, this whimsical plush goat is perfect for hours of engaging play and imaginative adventure. This little plush cow is adorably unconventional with a huggable square body and soft white and black fur. This little plush pig is adorably unconventional with a huggable square body and soft hit pink fur. This huggable plush goat has soft white fur, tan hooves and horns, and special wires for posing. Plush goat is Billy Bob has stunning variegated brown and white fur and a cuddly understuffed body. This huggable stuffed Nubian goat has soft rust fur, tan hooves, and signature long cream ears. This beautiful Cuddlekins stuffed mountain goat has soft white fur with gray hooves and stately gray horns. Rocky, this sweet little plush mountain goat has soft white fur, black hooves, and majestic horns. This Handfuls plush mountain goat has soft white fur that is short on its tummy and shaggy on its cuddly body.